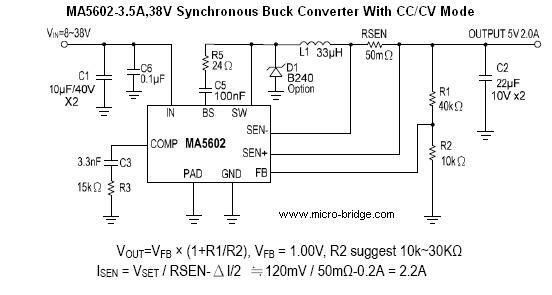 MA5602 is a wide input voltage, high efficiency Active CC step-down DC/DC converter that operates in either CV (Constant Output Voltage) mode or CC (Constant Output Current) mode. MA5602 provides up to 2.5A output current at 180kHz switching frequency. Current mode control provides fast transient response and cycle-by-cycle current limit.